Indo-Baktria, Apollodotos I , AR Square Drachm, Whitehead 246. Apollodotos I, Baktrian kingdom, AR square drachm, 2.36 gr, 160-150 BC. 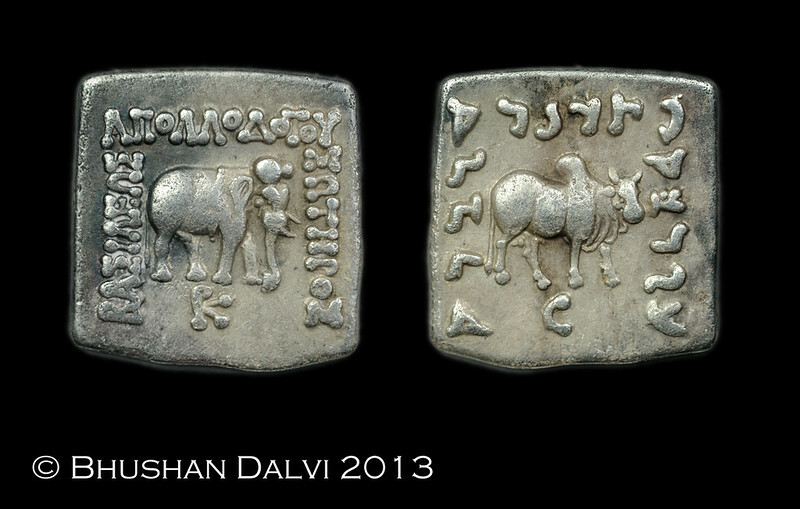 BASILEWS APOLLODOTOU SWTHROS around elephant standing right, PK monogram below / Karosthi legend around humped bull standing right. C below. Whitehead 246. Please let me know what you guys think. I would like any advice on collecting these Indo-backtrian coins for my collection. My aim while collecting this series is to find eye appealing coins with most of the legend visible,acceptable surfaces and a decent strike. I have decided to spend some time trying to find and learn about the more common kings and their common coins before moving on to the more expensive tetradrachms. Re: Indo-Baktria, Apollodotos I , AR Square Drachm, Whitehead 246. Nice!!! Been looking for this quality coin for a while. How did you nab this one!! This is such a magnificent piece, Bushan. Have you seen the eye of an elefant on a coin before? What you render as W is in fact a capital omega (pronounced as the oa in roaming). To type Greek letters, you can use this page. Thanks Ram. I picked this one at a local show a few months back. Peter, thanks a lot. It took a lot of patience to find this piece as most I saw online or offered in auctions have either the legend missing or are worn to a point were only the outlines of the elephant & bull are visible. It took a while to find this one but I am glad to add it to my collection. Thanks for the correction too. I was lazy and copied it as was written without actually checking it. Simply stunning. A magnificient specimen. Thanks for sharing. Here's my specimen with different monograms and not as fine as your piece. It is nice to see an increasing number of people becoming enthusiastic about the indo-greeks/indo-bactrians. The coin you show is a very nice example of a type which is quite common and does not break your bank account. But it still shows all of the indo-greek borderland characteristics. The indo greeks are one of the focal points of my collection. But the best advice i can give you on expanding your collection is to continue just what you seem to be doing; Buy what you like and can afford. I am also one of those people who value the quality and completeness of the inscription. Small silver peaces usually can be aquired at a reasonable price. Tetradrachms of the early kings, more in the hellenistic style, are expensive, but you pay for quality. Later kings, like Hermaios, tetradrachms are far cheaper, but may be less artistic, especially the posthumous issues. I myself have taken my chances sometimes with the square bronze hemiobols. Usually the cheap onces are quite worn. But sometimes they are plain dirty and much can be won by gentle cleaning. To add to the series here, one from my collection. This one is from Jammu mint. The inscriptions are nice. But i prefer the depiction of the animals on you specimen. That's a nice mammoth ! It even has a nicely preserved chain around the belly. That is almost always worn of first. Thanks. Fell in love with it once I saw it. The mammoth is beautifully preserved and it also has the full legend on both sides. The bull also looks wonderful as well. Here's my example, not brilliant but I treasure it as the first Indo-Greek coin I acquired. I'd never noticed the chain before, but I assume that might explain the vertical line below my elephant's ear. Still very nice. When you look in online shops you'll see many in a far worse state ! That's the fifth example in a row. Nice for a reference thread ! Ditto. That is also a nice coins as well. And I agree with THCoins assessment. It is far better than the ones that are available online. Trust me I know as I searched and searched for a good looking coin online until I stumbled on the one I posted. BTW, I am in the process of creating a workable font for kharosthi. There are fonts already available, but it only contains the glyphs. Hence, you can not use them to write documents. I am going to piggyback off these fonts to create a workable one. Not easy, but worth a shot at least (the letters with its diacritic marks are quite complex and it is written right-to-left). Stunning specimen, easily the best I've seen.